In 20012 I spoke at Social Week Gives Back by the Pivot Conference. During that week I was first introduced to an APP called Banjo. They sponsored the event. Since then I’ve enjoyed tinkering with the APP, but recently there have been some dramatic changes. Last week I went on Fox News to discuss Banjo (video below). Here are 6 reasons why this is the most powerful APP in the world right now. Event Detection Engine- When you log into the Banjo interface, you can see trending events around you based on geo-location. This information is user curated. Sort of. It’s content that people are posting. No major news outlets, not propaganda. Just pure news. I love this. No Following! The Trouble with Following People is Following People. Every other social network grows by virture of who you follow, and who follows you back. On Banjo content bubbles to the top only if it’s relevant. That’s real power. 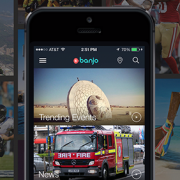 World Feed – Part of the Banjo’s secret sauce is that they pull from 12 social networks. So if you’re on Instagram and you have your geo-tagging settings on, you’re on Banjo. The implications for breaking news? Gamechanging. Simple Interface – I’ve had the benefit of being on the APP for a few years. The current iteration is gorgous, simple and powerful. Ground Up Utility and value of social – what happened BEFORE an earthquake. The ability to look back to see what happened leading up to an event is Banjo’s Life magazine moment. As time goes on this will only become more impactful. Think: moments before Tsunami’s, shootings, and the like. Citizen journalism by those who don’t realize they’re documenting a newsworthy moment. 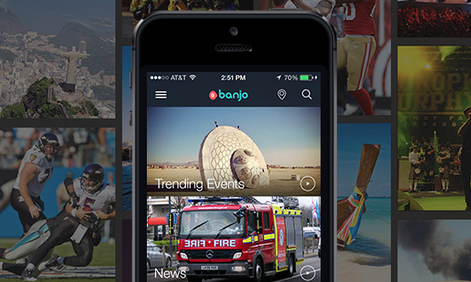 VISUAL LISTENING – Banjo listens to visual content. Have you tried Banjo? What are some of the industries other than Media that you think this APP could disrupt? Answer in the comments below, and let me know what you think? Hey there – my name is Chris Dessi. I’m the founder and CEO of Silverback Social.I’m also the founder of the Westchester Digital Summit, and the author of Your World is Exploding: How Social Media is Changing Everything-and how you need to Change with it. To read more from me on Linkedin, please click the FOLLOW button above or below.